Happy Summer to all you fellow renovators! I only have one pretty picture to show you on this installment of MisAdventures.Lots going on, just not much that is picture-worthy. 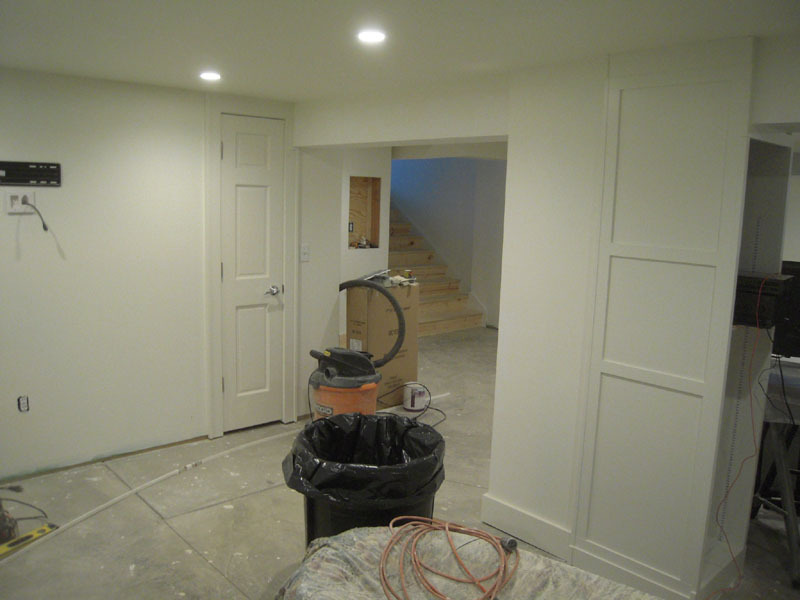 Sometimes I forget to snap a photograph, but most of the work has been tedious stuff like drywall finishing, painting and trim work. 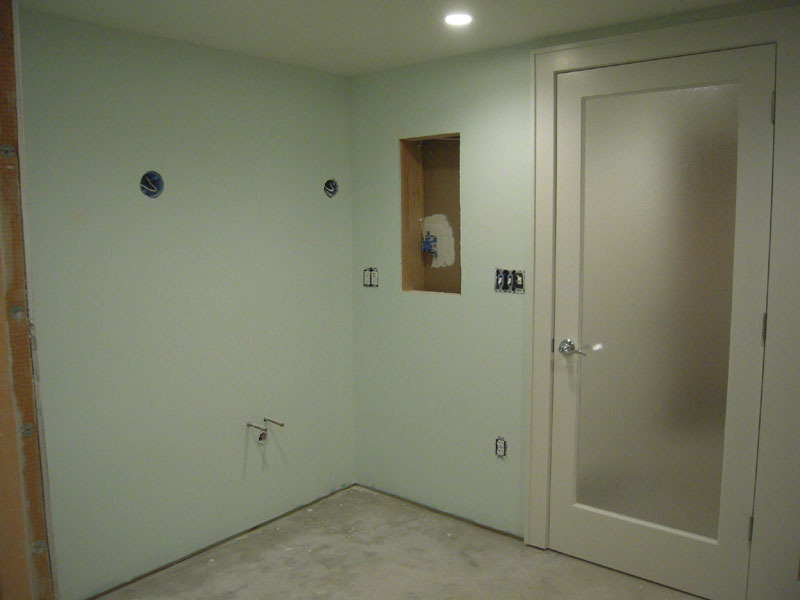 We’re closing in on finishing the basement project. More yet to do, but almost livable. I’ll do a proper before and after post when it’s all done. But here’s were we are as of this morning. I’ve got the basement ceiling in and all the drywall done in this room. It’s all painted with BM Moonlight White. 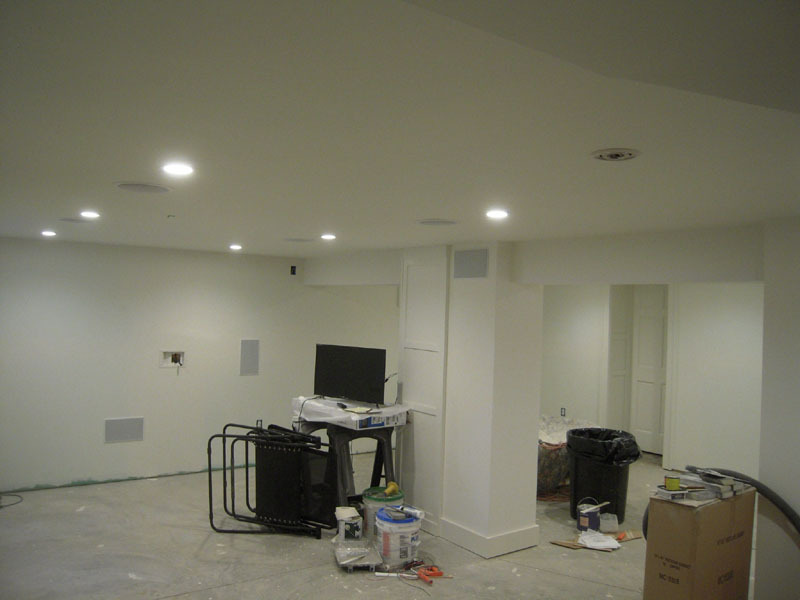 I’ve got the 9 wall and ceiling speakers in and all of the led recessed lighting. The system is set up for a 70″ TV. As everywhere else in this house, I’ve got more than enough light. There are 32 hardwired light fixtures on this level. 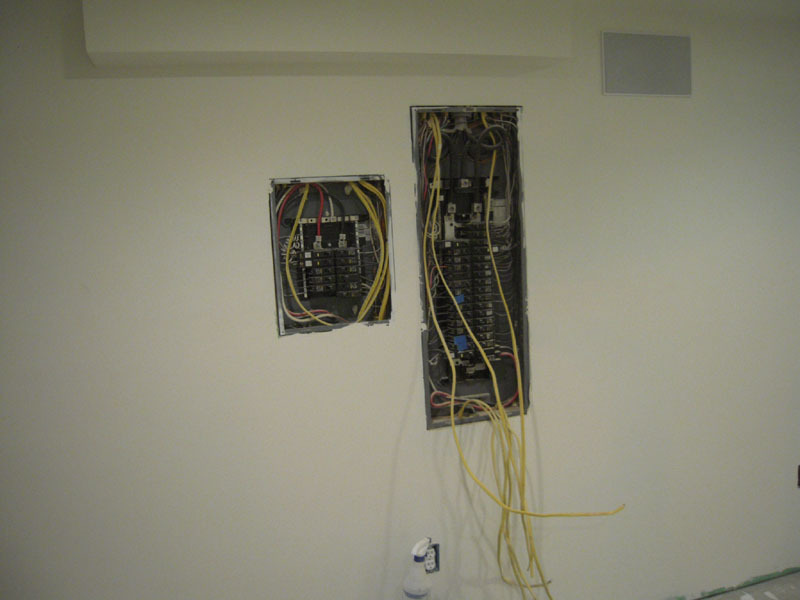 I still have to wire the final kitchen circuits and close this area up. I’ll figure some way to hide these boxes behind artwork or a chalkboard or something. 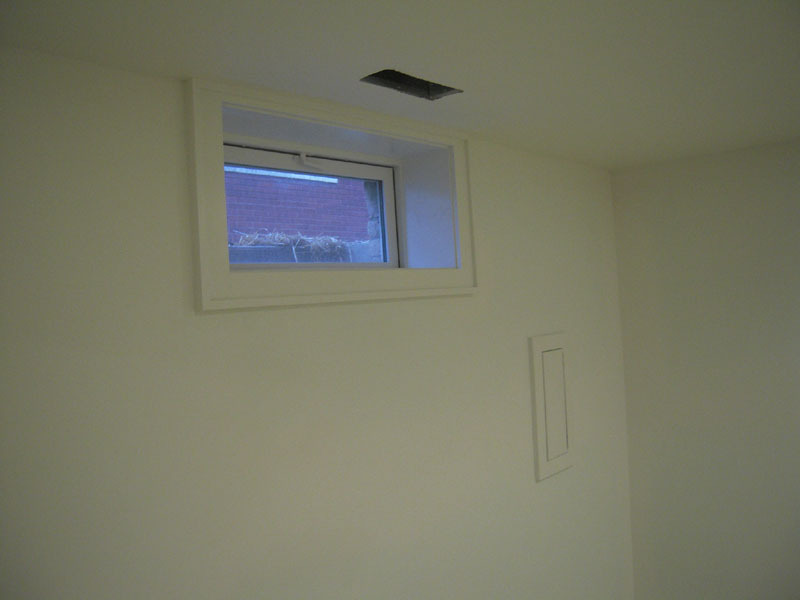 The egress window is trimmed out and cased with PVC trim. I’ll add a one piece sill on the bottom and finish trim this window. 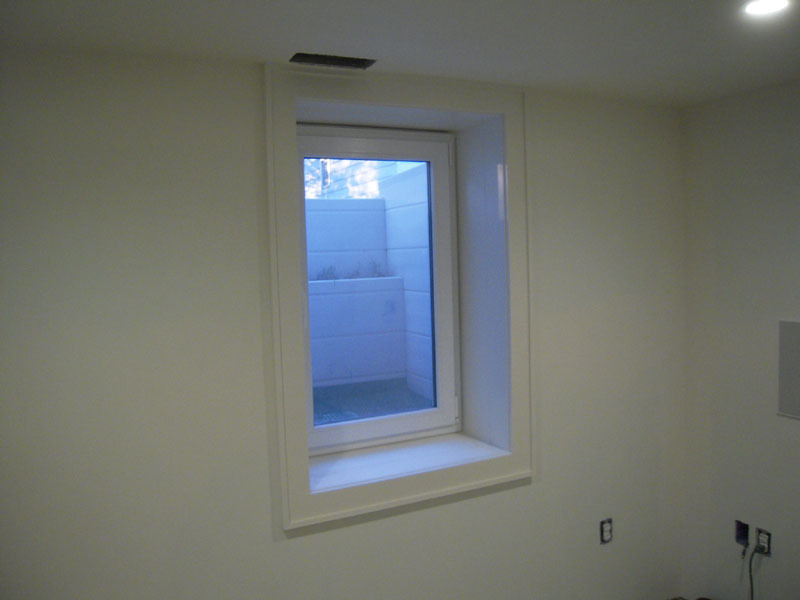 There are two small hopper style windows that are also trimmed in PVC. I like this material around windows. If it gets wet, no big deal as it’s 100% waterproof. No swelling or paint problems. I still paint the window’s trim with BM Impervo acrylic enamel in a white match which is the same color as the sunroom trim. The little door hides the whole house water shut off. 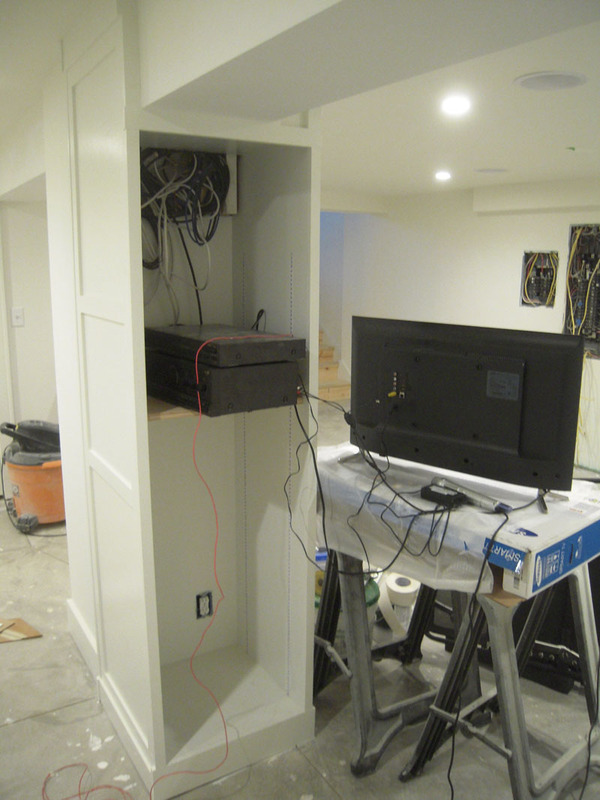 Looking back towards the stair, there’s a little utility closet to the right of a small TV mount. The AV cabinet and all the wires. Just testing the lines with some old equipment before I start putting in the cable terminals and final set up. 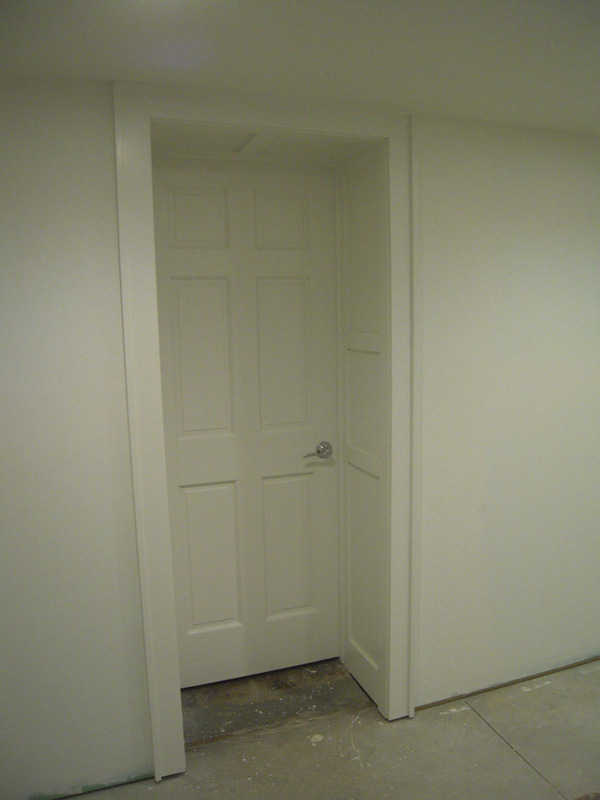 Here is the extra deep door to the work room / utility room. This wall is a support wall dividing the woman cave from the work room. The concrete block wall was 8″ wide, plus two 4″ wide walls with spacing makes this about 18″ deep. I needed this door to swing in to the work room and have the widest possible opening. 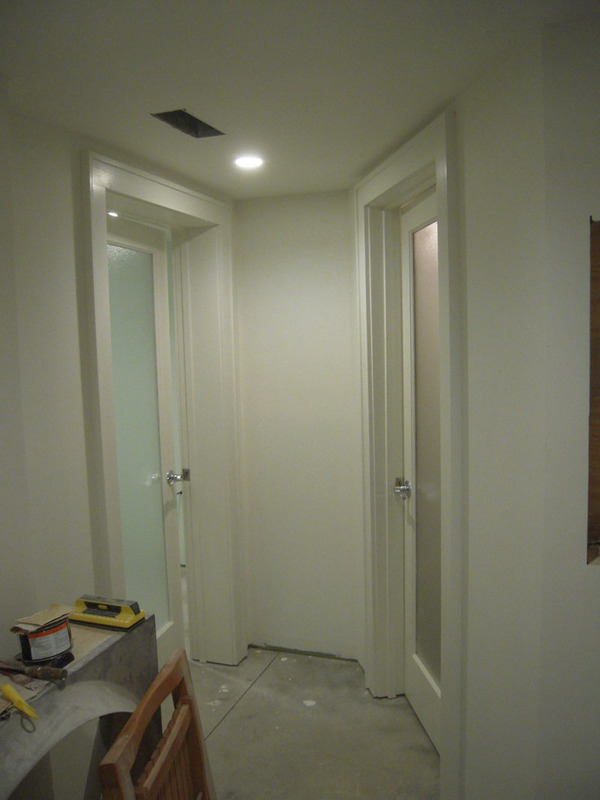 Doors are in for the bathroom on the left and the pantry on the right. 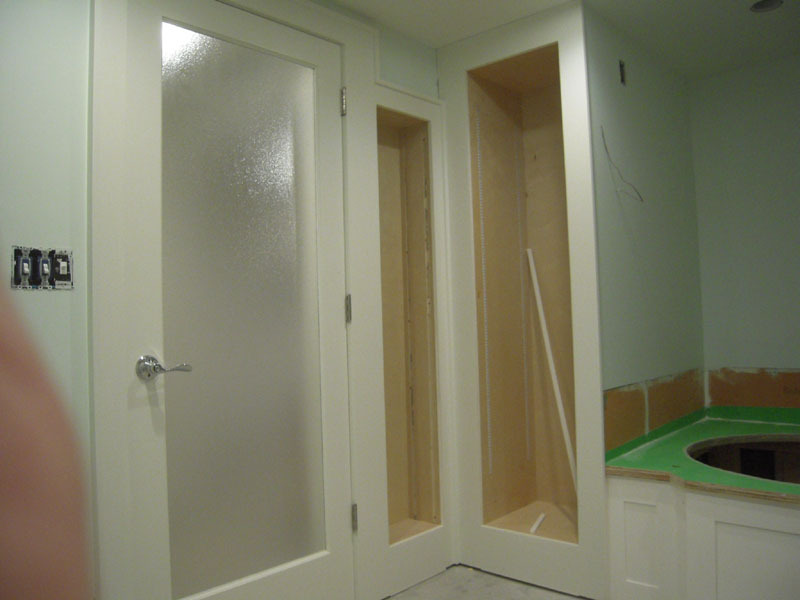 I used single pane doors with obscure glass on the doors to match the rest of the house and give it a vintage spa feel. 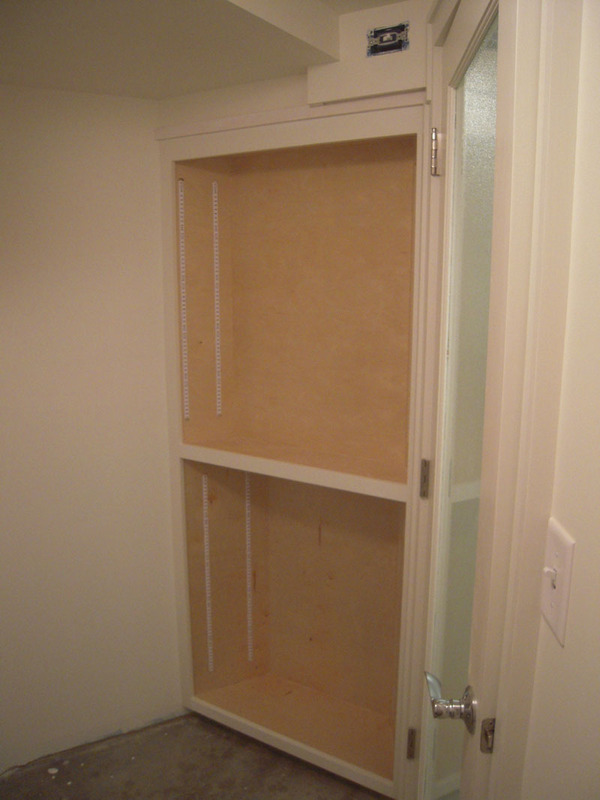 Inside the pantry area I built this removable storage cabinet. It has to be removable to get access to the bathroom inline fan. The little switch above the door is used to override the fan circuit that automatically comes on with the light in the bathroom. 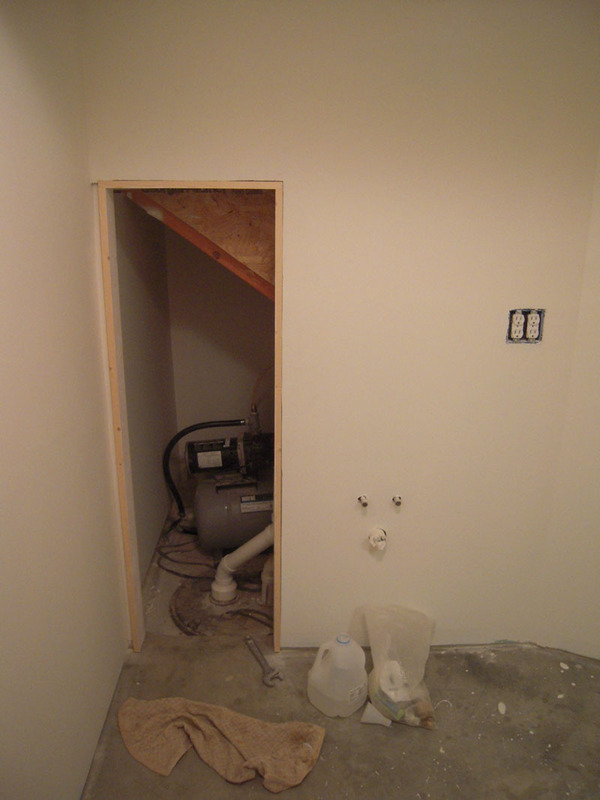 This is the access to the well pump and sump pump under the stairs. I’ll be adding another tank to the pump system to add more capacity for watering the garden. The pipe stub outs are waiting for me to plumb in a utility sink and vanity. Inside the spa area I’ve built two cabinets – the one on the left will get a mirrored door and the one on the right gets open shelves for towels and baskets. All of the trim in this room is PVC. The vanity wall has a medicine cabinet on the wall right of the sink. 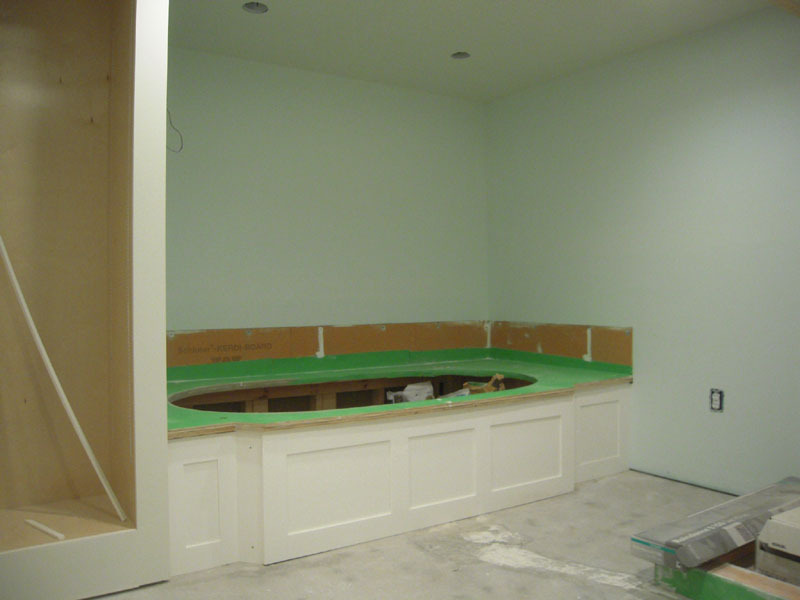 It’s placed here because the sink wall is a below grade exterior wall and it wouldn’t fit. We’ll see how this works out.It doesn’t really show, but the bathroom is painted with BM Italian Ice Green in their Matte bathroom paint. 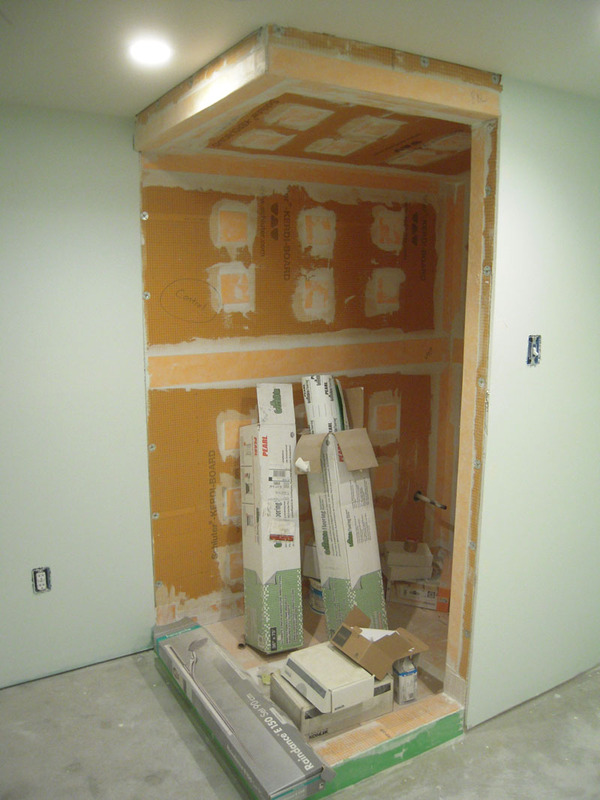 The steam shower is ready for tile. The tile guy will be here in a few weeks to finish this room and the pantry. I’ve built the whirlpool tub surround panels. Again, made from PVC to make them waterproof. All the panels are removable to access the pump and plumbing. I’ll finish trim these when the tile is installed. And finally one pretty picture. 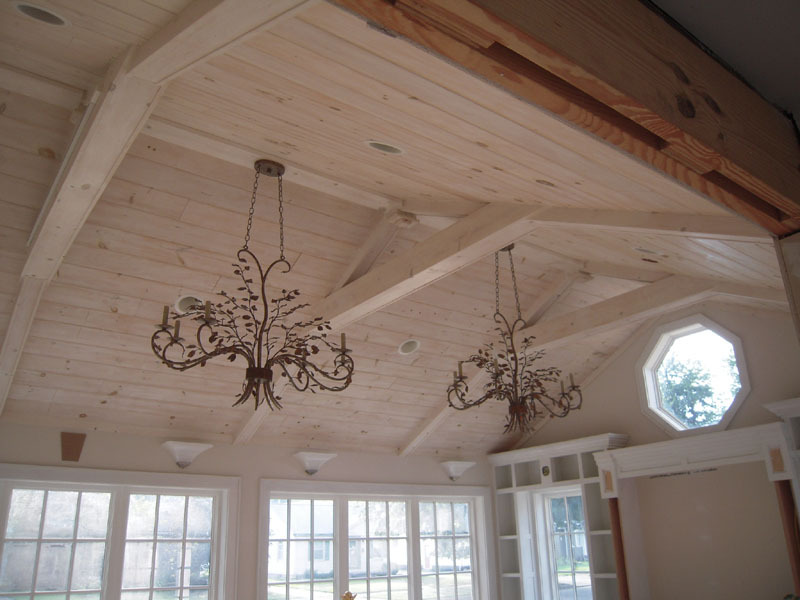 I needed the space in the garage that these chandeliers were occupying, as they were in 4’X5′ boxes. I decided to go ahead and install them over the weekend, along with the wall sconces over the windows – since I’ve had them here waiting for this day since 2013. This is a pair of Curry & Company Raintree Oval Chandeliers. I think they’ll make a good contrast to the medium valued wood floors when they go in. I love layering light, so I planned seven different light sources in this room. Recessed over head, Chandeliers, Two circuit track lighting, wall sconces, Bookcase accent, table lamps and window light. It is a white valued room, so the light sources will add texture and interest to the space. Or – that’s how I figured it.